It has been claimed from several sources (Lloyd’s List, John Verschelden) that the containerized trade imbalances between Asia and the EU are going to decrease. Moreover, it is claimed that the imbalances have a significant impact on the value of the freight rates. Therefore this paper aims at answering the question of how the containerised trade flow imbalance between Asia and the EU may develop and how this will affect freight rates, both east- and westbound. To answer the question on the development of the imbalances, first we look at the volumes of exports and imports and their main products. The main traded product categories turn out to be SITC 5, 6, 7 and 8. To determine the actual containerised imbalance on the seaway between Asia and the EU, it is necessary to estimate the degree of containerisation and the modal split. Taking those two factors under consideration, it becomes obvious that the degree of containerisation varies according to trade direction (westbound, eastbound). This difference of between the degree of containerisation eastbound and westbound also has an effect on the imbalances. A broad trade- and economic potential analysis shows that especially China and India are projected to grow. To simulate different economic situations, a Global Simulation (GSIM) model is run with three different scenarios. The first scenario is dominated by a strong demand shock. If Asian countries are growing fast, purchasing power of Asian consumers could increase, which would stimulate Asian aggregate demand. The second scenario simulated a strong supply shock, assuming production increases – as is the case today – keep on developing faster than demand increases in Asia. The third scenario shows a substantial growth in both supply and demand. According to these three scenarios only in case of a very strong demand shock in Asia (especially China and India) – i.e. scenario one – a reduction of the imbalance between east- and westbound container flows can be expected. In both other scenarios, the imbalance is going to persist or grow even larger. 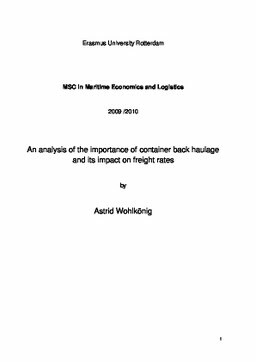 To determine the effects of the imbalances on the freight rate, a regression analysis has been used. Several variables, such as distance, container imbalances, economies of scale, imbalances of value of containers and competition have been taken into account. The results show that the imbalance has a small but significant positive effect on the freight rates. We find that a 1% increase in the imbalance will lead to a 0.2% increase in freight rates. The coefficient of the imbalances helps to determine a range of possible results of freight rates.